The Fortify This Collective presents this eponymous exhibition to highlight the longevity, creativity, and achievements of Indigenous artists’ production in northwestern Ontario. 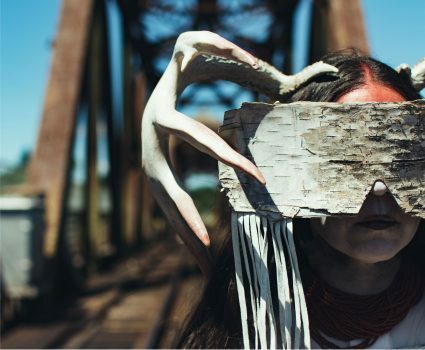 Featuring photographs, drawings, beadwork, wear-able art, painting, and a multimedia installation, the show’s nucleus is a photographic series of a performance mounted by particular Collective members at Fort William Historical Park (FWHP) and the James Street Swing Bridge on the side of Fort William First Nation on June 16, 2017. This multi-dimensional show amplifies the accomplishments of Indigenous rights, cultural autonomy, self-determination, and sovereignty and, subsequent to that, strategically disrupts stagnant iterations of the colonialist past. Its realization is based on effective collaboration, using relational and dialogic approaches to make it happen. Join us for the Gala Opening Reception featuring Art-Music-Artist Talks and coinciding exhibition with the Lakehead University Retrograduate Show, catered refreshments, and more! Gallery 2+3. Show runs May 18th- June 16th, 2018.